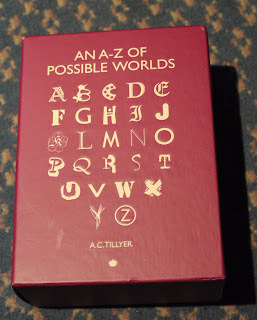 Just before I went to China I had the pleasure of reading some of the short stories in A.C. Tillyer's 'An A-Z of Possible Worlds'. Although I've not yet had a chance to read all of them, I have much enjoyed those I've read, each one taking me to remarkably imaginative place. There are some great descriptions: for instance in the Kingdom 'bands of deserted towns mark the retreat of the sea like concentric rings in a tree trunk' and the suspense builds to the creepy and plausible ending. It reminded me of something out of the TV series the Avengers - a satisfyingly disturbing fantasy; one that draws the reader into a world that is as real a dream at the moment it is being dreamt. The author has kindly agreed to answer a few questions about herself and how the collection came about. A C Tillyer lives in Peckham, South London. She works as a documentary film editor and has cut a wide variety of programmes, from ballet and architecture to crime, piracy and the holocaust. 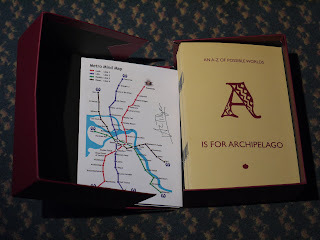 Her first book, An A-Z Of Possible Worlds, is published by Roast Books. 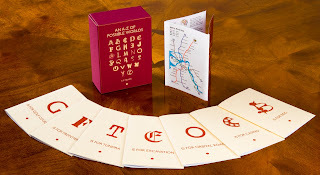 It is a box set of 26 interlinking short stories, one for each letter of the alphabet. Each story describes a possible destination on a journey around the mind and asks what would happen if parts of the brain were personified and allowed to populate entire countries. They can be read in any order. 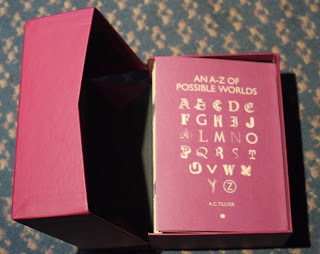 CD: An A-Z of possible Worlds is a fabulously original idea - the packaging and, of course, the words. How did it come about? ACT: Well, thank you! The idea for the first one came from when I used to catch the train to work and every morning we would pass a golf course. Whenever I looked at out, the golfers seemed to be doing exactly the same thing, as if they were robots. I thought: what if they are? So that became 'The Golf Course'. Then there was this man that I saw every day who looked extremely ill, very thin and jaundiced, but he was always carrying an enormous sports' bag with a squash racquet poking out of it. He didn't look like he'd make it to the end of the platform let alone last beyond the first serve on a squash court. So I began to think that, if the racquet is just for show? What is he really carrying in that bag? What if it's the dismembered remains of his last victim? That became 'The Underground' and then I was off. At first, I did them for fun but, as I became more engrossed in 'my countries' as I called them, they began to seem like destinations on a journey around the brain. Once I'd written about ten, I realized it could be an A-Z. It was good to have a limit, otherwise I'd still be writing them! CD: You say you wrote A-Z for anyone trapped in a packed carriage and wished they were somewhere else, and give some fantastical examples. Do you ever imagine your ideal reader? Who would they be? ACT:Another bookworm, just like me! CD: You wrote the stories on a train. Please tell me a little about how you did that. What processes were involved? Did you generally finish a story in one journey? ACT: Ha! If only... I'd start with an idea or question, such as: What would happen if everyone started taking care of themselves and life expectancy soared? Would there be a riot, a cull, voluntary euthanasia - or a lottery? From that I'd jot down the outline for a story in a notebook and not let myself stop until it was done. If there was a bit I couldn't work out or needed to look up, I'd leave it as a question and carry on. That was the train bit. Then at home, I'd put the story into proper sentences and work on that until it was ready to be typed up, which could take ages. I can't write straight onto a computer as I need to see all my crossings out and scribbles in the margins. Once I start typing, my brain seems to relax and switch off. CD: Do any of the stories have an interesting origin or story behind them? ACT: Sometimes it's the smallest thing that sparks off a chain of thoughts. For instance, in one of the Sunday supplements I saw a picture of a computer-generated face that was meant to be an amalgamation of all the faces in the world. I can't remember the exact number, but there's a certain amount of random faces that, when you morph them together, you always get the same face and after that, however many you use, it always turns out looking exactly the same. I thought that was pretty amazing and that was the origin for 'The Tundra'. To give one more example, I heard that in London there are between 30 and 35 dog bites a day that need hospital treatment. Never one day when there are suddenly 10 or 100. I know you could probably explain the figures with the number of irresponsible dog owners, available parks, noisy kids, or whatever else goes on before canine teeth sink into human flesh, but I was surprised by how consistent those statistics were. It was almost as if it had been designed, which made me think: what if it has? So that was the idea behind 'X marks the Spot'. CD: Are they inspired by any other writers? ACT: That's hard to say. Not consciously. But I suppose everything you read feeds into your own writing somehow. Having said that, there's a few that have been directly inspired by other things, such as paintings. 'The Archipelago' was definitely inspired by Bruegel's painting of The Tower of Babel. And there's a film, which I think is brilliant, called 'Thirty-two Short Films about Glenn Gould', which really is precisely that: thirty-two short films about the pianist, Glenn Gould, including x-rays, clips from interviews, drama and animations. I really loved the fragmentary approach to a person's life. You're left, somehow, with a bigger idea of the man but also, a sense that you can never pin anyone down. I also love Kieslowski's Decalogue, the idea that each of the ten commandments are broken within a short space of time in a single housing estate. So I think that kind of approach fed into what I was trying to do in the A-Z. That's my film background coming through! CD: Which is your favourite story, and why. ACT: If you'd asked me that just after I'd finished it, I would have said 'The Labyrinth' because it was so easy to write. That one just flowed. But now I'm quite fond of the historian in The Excavation. He's a little guy, obedient and unheroic, who takes a stand against a rotten system, even though he knows he can't win. I like to think we'd all do that if we had to. CD: Do you feel any of the stories are linked, and if so, how. ACT: Some of them are specifically linked, such as L, M and X, which are the past, present and future of the same city, and the entrepreneur who buys up 'The Golf Course' is also the creepy punter in 'The Peep Show' and turns up again as a body in a tank in 'The Warehouse'. There are more links like that all the way through, but it really doesn't matter if you don't spot them. The biggest link is the overall idea that they are all destinations you could visit if you went on a a journey around your brain. Well, mine anyway! I'd like people to wonder what they would find in their own head - and if they'd want to go there if they could. ACT: Funny you should ask that... I once had a pink, plastic handbag that was like a box on a strap. I don't know what it held originally but I kept snails in it and carried it around with me for an entire summer. Occasionally, one would die and I'd line up my teddies to sing hymns while I buried it with a little cross and everything. I was six or seven years old and I wasn't allowed a pet. Do you remember that film called Gothic by Ken Russell? It came out way back in the eighties. I went to see it and, because they didn't let you drink in the cinema, I hid my can of beer in the hedge outside cos a can of beer was a precious thing in those days. Well, it was an extremely freaky film for a teenager that had grown up with no telly and I came out wide-eyed and dry-mouthed. When I went to retrieve my can of beer, it was covered in snails and I had nightmares about one coming out of my mouth instead of a tongue for weeks afterwards. Just thought you'd like to know that for your records! ACT: I was lucky enough to have a Wonder Woman moment when I was living in Manchester. This kid on the street where I lived nearly rode his bike under a car and I threw myself into the road to stop him. I behaved with great modesty when his parents thanked me - and kept thanking me - but inside, I was thinking Yay! I'm a Super Hero! Everyone should have the chance to save a child's life at some point. Probably not very fair on children, though. ACT: I'd like to say something grand and classical, but it was probably hearing Joy Division on the John Peel show when I was twelve or thirteen. I was captivated. It was because of them that I chose to go to Manchester University and it was there that I got into film and all that followed that. I guess it's always the things that happen to you early in your life that have the most influence on you. ACT: I went to visit someone in a care home and we had to walk through an enormous room that looked like an airport departures lounge. It was empty apart from an old woman and, as we passed, she said: 'I'm all on my own in an old peoples' home'. ACT: My temper! It even scares me sometimes. ACT: Scamper down to the kitchen, make a coffee and go back to bed with a book. Even when I have an early start, I still need book, bed and caffeine before I can function. 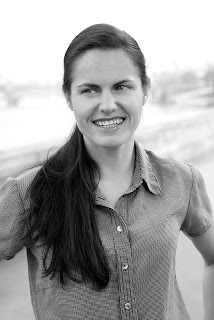 Dear Clare: My name is Elisabet Salvatore and I come from Rosario, Argentina. I've already read this interview and I've found it really interesting. I am a teacher of Englishe and I've given my students one of AC Tillyer's short stories, 'The Archipelago'. I started searching for information about the author and I found a video at Vimeo site. This interview was done by 'eclectictrains'. I am interested in getting the video so that I can show it to my students. I was wondering if you could help me. I want to download it and record it to take to school because we do not have internet there. China International Silk Forum 2009 Part 1. China's New 'One Child' Policy. Business Card Storage: I have the technology. The Buzz, the Roar and the Fight for Sleep.